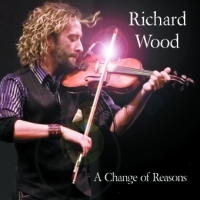 RICHARD WOOD – A Change Of Reasons (GCP 098) With over two decades behind him as a professional musician fiddle exponent Richard Wood is very much a ‘traditional’ performer. Although he’s Canadian his Scots roots are proudly on display in that clipped strathspey way so beloved of others like J Scott Skinner (a great showman himself) and Alasdair Fraser. As a showcase for his talents this double CD is a fine calling card featuring flashy fingered dexterity such as on his own composition “Use Your Imagination”. The title is dedicated to the 100th Anniversary of the publication of ‘Anne Of Green Gables’ and captures the feeling of exuberance experienced by the youngster perfectly. So, here we have a ‘thinking man’ who treats his art with respect and not a little bravado when he needs to. To help him fulfil his goals, he is ably assisted by a group of musicians including J P Cormier and current partner in crime, guitarist Gordon Belsher. Featuring plenty of up-tempo sets with a pause for breath on the slower paced “Dean Brig O’ Edinburgh” before launching rocket like into the triplet provoked version of that old favourite “Trumpet Hornpipe” there is plenty to put a smile on the face of the sternest critic.